This is something, what's happening here at old Chicago Stadium. What will happen. What could happen. On Wednesday night the Chicago Bulls were to play the Cleveland Cavaliers here in Game 5 of the semifinals of the NBA playoffs. On Saturday the Chicago Blackhawks will play the Pittsburgh Penguins here in the third game of the Stanley Cup finals. The next day the Bulls will play the Cavs here in Game 7, if the series lasts that long. On Monday the Blackhawks will play Pittsburgh here in Game 4. Wood, ice, wood, ice—on and on like that until one or the other Chicago team falters or reaches the summit of its sport. It could happen—teams from the same city winning the NBA and NHL championships in the same year—though it never has. Not in Boston. Not in New York. Certainly not here in the Second City, where sports fans learn early to moderate all championship expectations in deference to the fates of Chicago's major league baseball teams, the Cubs and the White Sox, which between them have not won a World Series in 159 years. 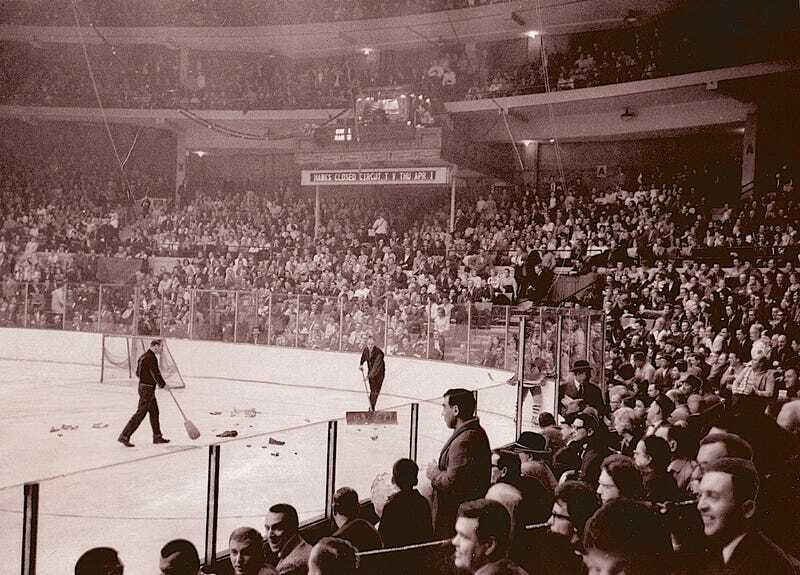 And it certainly hasn't happened in aging, lore-stuffed, elevator-free, noise-racked Chicago Stadium. But it could happen this spring, right here in the Big Barn at 1800 West Madison Street, right here in the bland brick-and-limestone joint that opened on St. Patrick's Day, 1929, and was promptly declared by the Chicago Tribune to be "the finest and largest sports stadium in America." It could even happen on consecutive days. Boom, boom! Ice, wood. Or maybe wood, ice. Nice. Unreal. Either way. His Airness, Michael Jordan, thinks about the possibility of double champs at the Stadium, "it would be great, especially for hockey," he says. "We won our title last year, but what has it been...31 years since the Blackhawks won?" Exactly. "Mostly, I'm just trying to understand hockey. I talked to [Blackhawk coach] Mike Keenan, and he explained it—blue line, icing. But I still don't get it." He does get the meaning of the Stadium itself, this relic from an era so bygone that it kindles his imagination as an old newsreel would, making him think of his place in time, of men in fedoras, of cars with running boards, of old games in old uniforms, of all those years before salary caps, TV, Japanese investors, Nike. "This place is full of history," Jordan says. "Teams come in here and don't like it, this raggedy old place with little locker rooms in the basement, three or four showers, and maybe the hot water doesn't work. I love it. The mystique. It's old-fashioned basketball. I love tradition."